At the top side of the window, the user can add recipients for the message, choose the mail box to send the messages from, ask for receipt from the recipients, save the message as draft and send the Email. 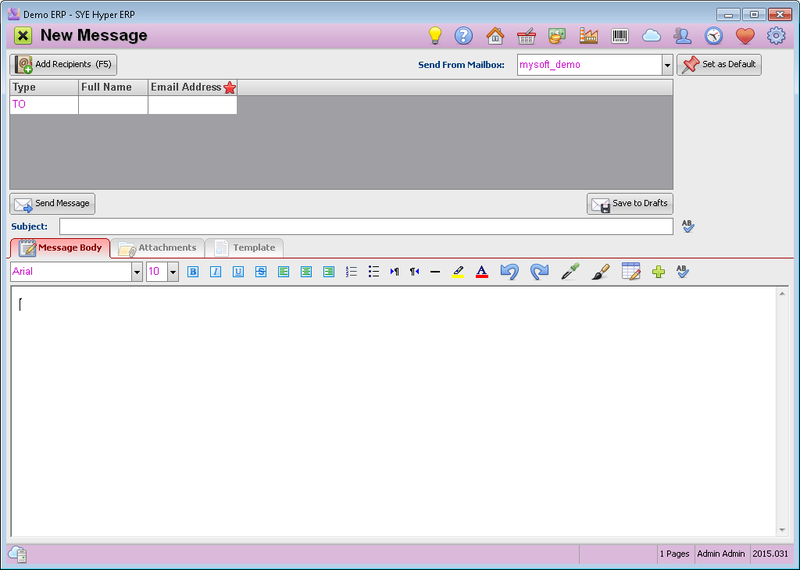 The center of the screen is used to write the message body, add attachments and templates and to design the message. Searching recipients in Clients / Suppliers / Projects cards. Write the required name in the search field and press the relevant search button. Double click on the chosen recipient in the search results window will add the recipient and will attach the message to the recipients Relationship Log. Searching recipients in Personal Contacts list. Choose the requested recipient from list or use the search field. Please note - We Recommend to avoid adding Clients and Suppliers to the personal contact list, so that any of contact persons will be attached to their Relationship Log of their Client / Supplier Card. Choosing Colleagues (Users). Select Colleagues the from list or use the search field. Right click on selected colleague, will suggest to send the message to the colleagues private Email Box. (As was defined in the employee card "Private Email field"). Recipients list - On the right side of the window the chosen recipients list will be displayed. The user can choose the type of the recipient from the suggested list (TO, CC, BCC). By using CTRL+R, the user can define the type for multiple recipients. Send From Mailbox - Choose a Mailbox to send the message from. After choosing a Mailbox, it can be set as at default by using the Set as Default button. The message should be written in this area. At the top of the tab there are several edit tools. For further information about the edit tools click here. choose file from the local computer. Choose from the list of documents that have been uploaded to Hyper. Scan multiple A4 Pages and store it as PDF File. Import Virtual Printing and Store it as PDF File. Scan a Single Image and Store it as JPG File. Scanning from scanner with a net connection is possible according to the Driver settings. share contact person or Client / Supplier card with the recipients. Attach a file of the screen image. Using this option will open a new window presenting the user's desktop. Left click on the mouse and drag the pointer to capture the reqired image frame. If windows settings were defined on "Fade Mode", the system admin should set the delay of the "screen capture" to 0.3 dec (Driver). Use the selected template for the Email. Chhosing a template will delete any writen contant in the Email. Temlate Name - the name of the template for the templates list. Subject String - A subject for the Email when using this template. Append user Signature - Choose whether to append the user signature to this template. When choosing "Yes", the "Email signature" window will be opened for the user to edit his signature. The message can be saved as draft by using the Save to Drafts button. Please note - messages will not be saved as draft automatically. After Choosing recipients, press the Send Message button. The message will be moved to the Sent Items tab. Alternatively, the draft can be saved again. Send Mail In Wide Circulation - Unlike the regular methon of sending Email messages, this action is done from the local computer of the user. The system admin must verify that the computer is able to communicate the Mail Server in port 25. The system adminitrator can define whether to active the filter for the incoming Email messages. The system checks the EMail address and the Domain of the sender and compares it with the records of the Client / Supplier / Project cards in the data base, the personal contacts list and the approved addresses of the white list. If no match is found, the message will be added to the "Deleted Items" folder. In order to define the Spam Filter, open the Autorization label of the Client Card. In the "Spam Filter" field, choose "Simple White List". Internal@mail - Internal mail only. The user can not serd or receive messages from out of the Hyper system or from out of the organization. This mail box is automatically created for any of the organization users. Any of the hyper users can receive an Email messages by choosing his/her name from the list of Colleagues (Users) in the "Add Recipients" window. There is no need to define additional fields for these users. The users can send and receive internal messages only, unless there is a public mail box. Email Address The Email adress to send and receive Email messages. This address will be also written in the "Email Username" field. Delete Messages from POP3 Hyper gets the Email messages from the Email server and stores each message separately. This field defines when to delete the message from the server (not in Hyper). If the user prefers not to delete these messges, contact the SYE customer service. While installing Hyper, the system allows to install the Hyper Virtual Printer. By using the virtual printer, it is possible to Import a Virtual Printing and Store it as PDF File, which can also be sent as attached file. This option is available from the Scanner / Virtual Printing button.